The main result from this weekend’s NATO summit in Warsaw was the official proclamation of a “containment” strategy toward Russia. So far, the practical consequence of this declaration is modest in military terms—a total of 3,000 foreign troops will be deployed to Poland, Lithuania, Latvia and Estonia. Far more important are the politics of this decision. The “Russian threat” is primarily defined as hybrid, that is it’s covert and exists on the borders of war and peace, state policy and social dynamics. The concept of “hybridity” is central in today’s confrontation between Russia and NATO. Back in January 2013, General [Valery] Gerasimov, the Chief of Russia’s General Staff, wrote his famous doctrine, which pronounced the onset of a “revolution in military affairs.” In urging that the Kremlin needed to learn from the “Arab Spring,” Gerasimov argued that today “A focus on applied methods of conflict has moved toward the widespread use of political, economic, informational, humanitarian, and other nonmilitary measures applied in coordination with the protest potential of the population”. It appears that in an age where open war between sovereign states is impossible, hidden war permeates society. Any internal conflict turns into a main battlefield, and to which the only option is military intervention. Hybrid militarization captures the public sphere so that every internal action can become a weapon of the enemy. Adopted by governments as an explanatory picture of the world, the idea of hybrid war is made real as it acquires the traits of state policy. Therefore, the classic laws of war are no longer valid, and the confrontation unfolds as a series of tacit, ever morphing signs to be deciphered not so much by politicians as by the military. Every sign gets a sign from the opposite side in response, which in turn receives a sign in response. Since the expansion of NATO into Eastern Europe and the Russian-Georgian war in the mid-2000s, the conflict has spun through a series of reciprocal phantasmal signs that gradually subsumes all varieties of societal manifestations—from the struggle over the public disclosure of information (the activities of Assange and Snowden) to mass social movements (the Syrian revolution, protests in Moscow or the Maidan in Kiev). Any independent political movement or any individual desire to change their country or the world for the better has been drawn into hybridity’s turbid logic. The state response to the hybrid threat also doesn’t have clear boundaries: it’s not just an increasing arms race, but also a thorough strengthening of societal control. Countering hybrid war is the best justification concocted since the end of the Cold War for virtually all of the elite’s actions. Resistance to this devastating, paralyzing logic on society should be the main task of today’s left on both sides of the new “containment” line. Nevertheless, we see that a large part of the left, often in spite of their best intentions, are actually included in the hybrid game as part of an attempt to “understand” or justify one of the players’ increased militarization. For example, on the eve of the Warsaw summit, the leading journal of the Polish left Political Critique called for strengthening support for NATO troops as a “realistic” solution to Russian aggression in Ukraine. 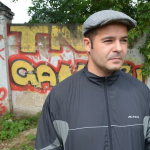 The largest Polish left party, Razom (Together), took a similar position (albeit more cautiously). On the other hand, it’s no secret that many prominent members of the Germany’s Die Linke limit their anti-militarist position to practically repeating Kremlin propaganda by denying Russia’s military presence in Eastern Ukraine and justifying Crimea’s annexation as a legitimate response to NATO expansion. This splintering of the left across different sides of the geopolitical confrontation is constantly provoked by mutual accusations of “hybridity”—as “useful idiots” or as paid agents in service of the Kremlin or the West. The only way to counter this (as well as reveal the level of sincerity in their “understanding” of Putin and NATO) is through consistent criticism of imperialism and militarism as global phenomena, and as part and parcel to really existing capitalism’s logic (this is the main thesis of Lenin’s classical works). 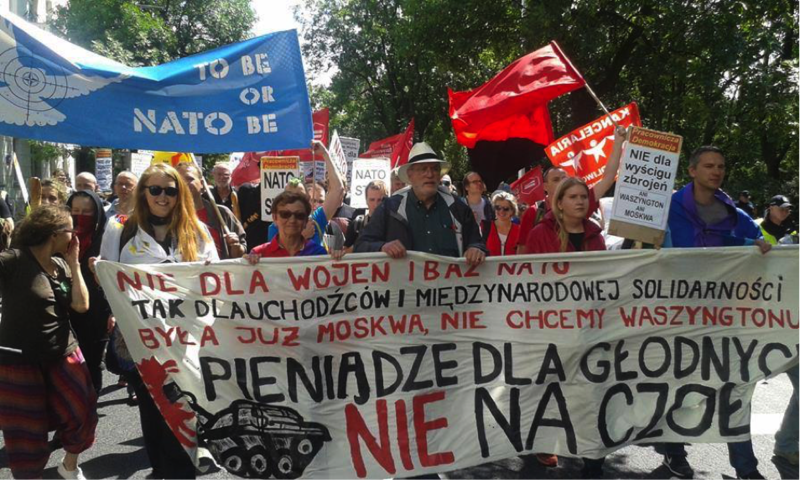 These difficult and, likely, the central questions for the European left were discussed at the antiwar counter-summit held in Warsaw on 8 July. Its participants—antiwar activists from Germany, Poland, Sweden, Finland, the USA, Portugal, France, the Czech Republic and Austria—presented different positions within the European left that sometimes came dangerously close the usual “understanding” of Putin. But instead of throwing accusations of “useful idiocy”, it is worth considering why, for example, American leftists consider their government responsible for virtually all military conflicts, and in connection with this, the German left’s historical concern about the constant expansion of the German army’s presence outside their country. In my short address, I tried to explain how you can only be true socialist and anti-militarist in Russia when you explicitly oppose aggression against Ukraine, against military support to Assad, and against pressuring post-Soviet countries. And I must say that the majority of participants accepted this position positively. Russian Presidential elections 2018: pre .. The next day, on July 9, only a few hundred people attended an antiwar demonstration held in the center of Warsaw. This modest figure—the result of an aggressive media campaign by the Polish media and political mainstream, almost directly declared anyone opposing the need for rapidly increasing the military budget as a Kremlin agent (Poland’s military budget increased by 20 percent in the last year alone). 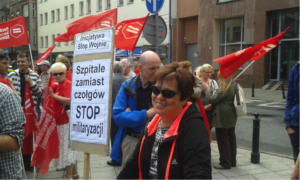 The small demonstration in Warsaw, of course, was also included in the information war. The Polish media almost completely ignored it (except perhaps only Gazeta Wyborcza), but RT, NTV and LifeNews all flocked to it like bees to honey. Such a situation is not the first time nor will it be the last time the anti-militarist movement risks manipulation by elites and states in a procession of infinite hybrid signs. The only way to avoid this is to constantly and persistently deny the logic of the confrontation in which common people on both sides of the front always become the victims. And the rally’s Polish organizers’ main slogan, “Neither Moscow nor Washington,” precisely harmonizes with this task. Translated by Sean Guillory, author of Sean’s Russia Blog, from the Russian original on OpenLeft. 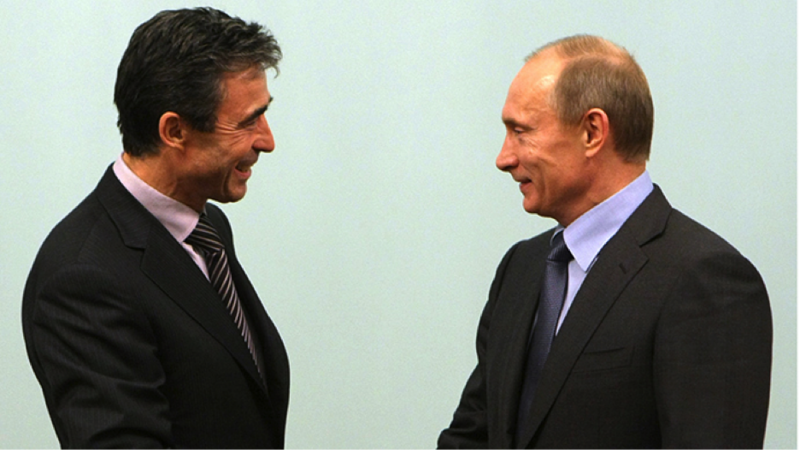 Ilia, you prove that you are an useful idiot for NATO. Agression against Ukraine? No help for Assad?